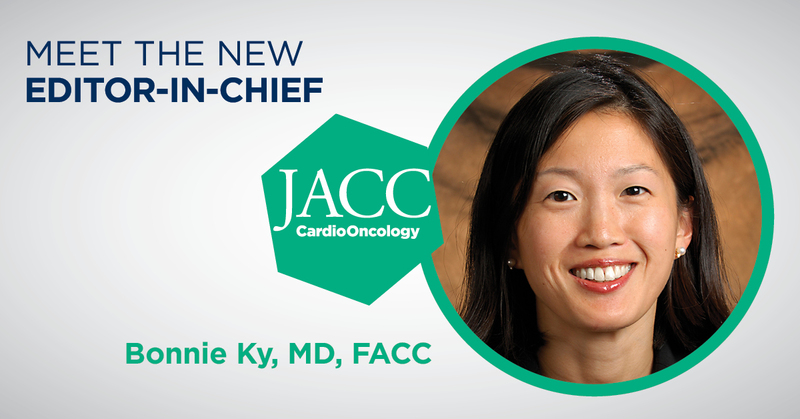 The American College of Cardiology (ACC) will expand the JACC family of journals with the launch of JACC: CardioOncology in September 2019. Bonnie Ky, MD, MSCE, FACC, will serve as Editor-in-Chief. JACC: CardioOncology will aim to publish the most impactful original research and state-of-the-art review articles pertaining to this rapidly emerging field. The journal will consist of original articles related to basic, translational, and clinical investigations in cardio-oncology. Topics of interest will include basic and translational mechanisms of cardiotoxicity; early diagnosis, risk stratification, prevention, and treatment of cardiotoxicity; and the multi-disciplinary care of cancer patients and survivors with cardiovascular risk factors and disease. Learn about submitting to the journal. Ky began her five-year term in March 2019. She is an associate professor of medicine and epidemiology and a physician scientist at the Perelman School of Medicine at the University of Pennsylvania. She leads a highly active National Institutes of Health-funded translational research program in cardio-oncology and is the Principal Investigator of multiple cohort studies and clinical trials focused on the cardiotoxic effects of various cancer therapies. Ky is also the founding director of the Penn Cardio-Oncology Center of Excellence, National Cancer Institute-funded ECOG ACRIN Cardiotoxicity Subcommittee Chair, and director of the Penn Center for Quantitative Echocardiography. She is an inducted member of the American Society of Clinical Investigation. She is also a section Editor for cardio-oncology for JACC. Another new journal, JACC: Case Reports, will launch in June 2019. Sign up now to receive issue alerts and editorial updates for the new journals at JACC.org/ContentAlerts.